Mimic-Ha is an animated hand made for cinema and theater with a synthetic silicone skin for prosthetics. It can be made in various sizes and shapes thanks to its internal 3D print structure. It can be controlled with a dedicated controller, with a smartphone via Bluetooth or via the Internet via ROS. They are studying upgrades to make it a prosthesis. The funds will be used to fund the development and implementation of new features in the Mimic-Ha animatronic hand. The goal we set ourselves is ambitious, turning Mimic-Ha into a low-cost customizable prosthesis that is both functional and hyperrealistic. 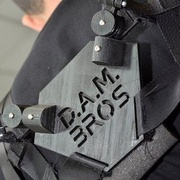 DAM Bros Robotics is a social promotion association that deals with research, development and divulging in the fields of robotics, electronics, information technology, mechanics, automation and rapid prototyping. Organize workshops, technical courses and other practical activities. He often participates in Robotics, Electronics, Computing and other technology-related competitions. It also carries out non-profits of social utility in various sectors including the Technological, Scientific and Cultural sectors. The association is a member of the Rokers Robot Builder community and collaborates with the team of Hotblack Robotics who deals with service robots. Reproduction in scale 1: 3 of the animatronics hand (size 4cm x 4cm). Hyperrealistic silicone finish. Supplied with metal hook. You will support the Mimic-Ha project and will also give you an original keyring. Reproduction in original dimensions of the animatronic hand (dimensions 11 cm x 11cm). Hyperrealistic silicone finish. Supplied on wooden base. You will support the Mimic-Ha project and at the same time give you an original ornament. Animatronic hand with Single actuator. Delivered with pilot controller. Dimensions 11cm x 11cm. Hyperrealistic silicone finish. With Mimic-Ha you will bring special effects to your home. Animatronic hand with Single actuator. Delivered with bluetooth board to smartphone control. Dimensions 11cm x 11cm. Hyperrealistic silicone finish. Animatronic hand with Single actuator. Delivered with board to control on internet by ROS, the Robot Operating System. Dimensions 11cm x 11cm. Hyperrealistic silicone finish. Including a video course of 5 hours on 'introduction to service robotics with ROS lasting (basic level). Including a video course of 8 hours on 'introduction to service robotics with ROS lasting (intermediate level).